While eyes have been watching Tropical Storm Danny as he barrels toward the Caribbean, hearts and minds have turned to remembering the utter devastation wrought on the Gulf Coast 10 years ago this week. Hurricane Katrina was the defining natural catastrophe of a generation, resetting the bar for our worst fears of what Mother Nature can do. 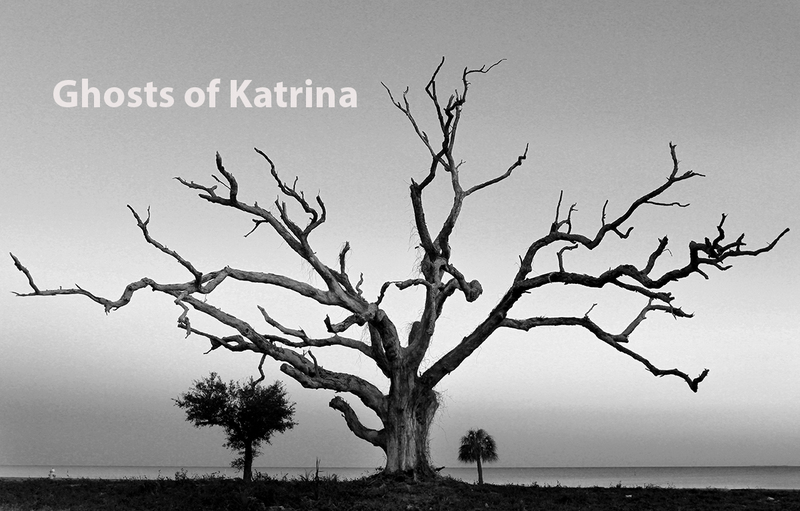 The Sun Herald in Biloxi has been building for weeks to a crescendo of retrospective Katrina+10 coverage that includes the haunting feature Ghosts of Katrina by photographer correspondent John Fitzhugh, which looks expressly at the remnants of the live oaks that a decade later are painful reminders of the storm. Meanwhile, coverage in The Clarion-Ledger includes many stops along the Gulf Coast, exploring the recovery in arts, infrastructure and day-to-day life at ground zero in Bay St. Louis. 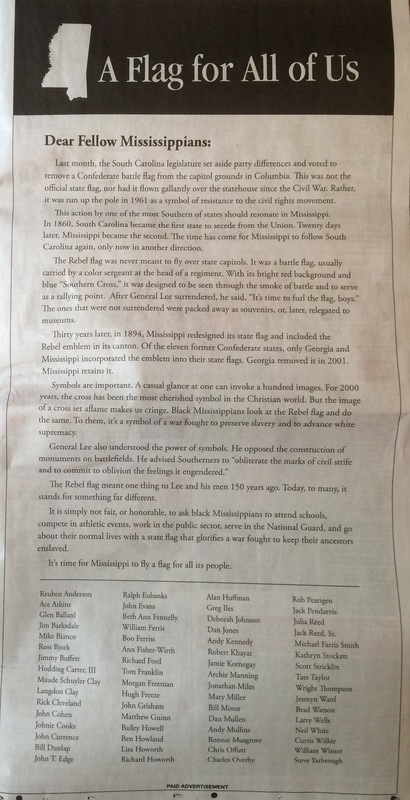 The signatures on the letter read like a Who’s Who of influential, respected and otherwise revered Mississippians. Names like Manning, Freeman, Grisham, Carter, Anderson, Buffett. The full page ad appearing in the Aug. 16 edition of The Clarion-Ledger calls on Mississippians to look into their hearts and then to the future, embracing a possible state flag design that would be inclusive of all residents. It’s a powerful message. Will the impact of the message and those who bring it make a difference in the arena of public opinion? Here are more articles worth ruminating in this Sunday Reader for Aug. 16, 2015. It’s so bad they’d rather join ISIS? 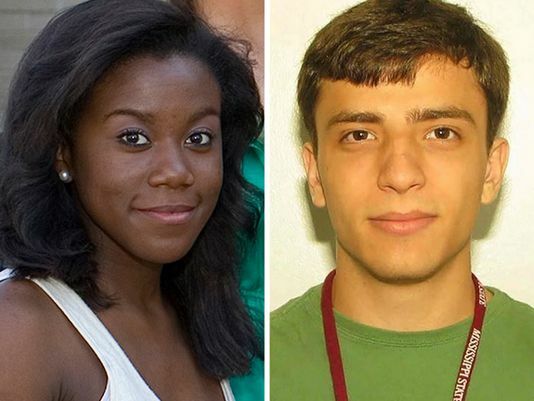 Either way, the bizarre story has thrust the state into the spotlight of an international story now that the kids – intent on marrying and joining ISIS – tried to do so by catching an international flight from , of all places, Golden Triangle Regional Airport near Columbus. 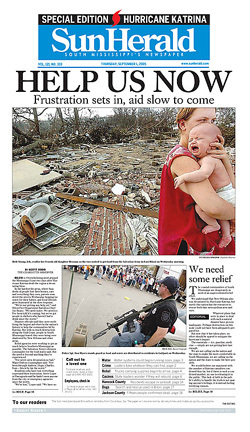 Here’s the roundup for Wednesday, Aug. 12, 2015, provided by Mississippi newspaper media on the story. Author Mississippi Press AssociationPosted on August 12, 2015 August 12, 2015 Categories UncategorizedLeave a comment on It’s so bad they’d rather join ISIS? 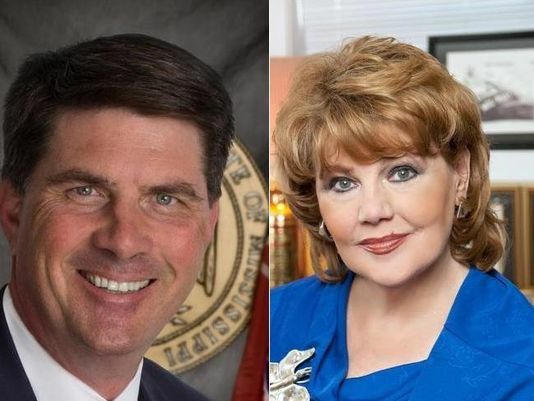 Incumbents facing opposition in the Tuesday primaries essentially got the thumbs up from The Clarion-Ledger and other newspapers this week with one notable exception. The controversy surrounding State Auditor Stacy Pickering has given some late-in-the-game traction to the campaign of Mayor Mary Hawkins Butler of Madison. The Madison County Journal, hometown newspaper for Hawkins Butler, also endorsed the Mayor’s insurgent campaign, but added another incumbent to its naughty list – Treasurer Lynn Fitch. Meanwhile, if you’re interested in the goings-on of some politicians who are not up for re-election Tuesday, consider the news that some of the Starkville Board of Aldermen think they’re due a 33 percent pay increase.